The catchment area is indicated with a black line. Allt a'Mharcaidh is a stream site on the western flank of the Cairngorm Mountains. The catchment area is 998 ha and it drains to the River Feshie, a tributary of the River Spey. The catchment rises from 325 m at the sampling site to 1111 m and is covered by alpine and peaty podsols (60%) and blanket peat (40%). The underlying geology is intrusive biotite-granite of the Lower Old Red Sandstone age. Vegetation is characterised by a heather/fescue grass mixture (90%) with native pinewoods (c. 2%) interspersed along the lowest reaches. 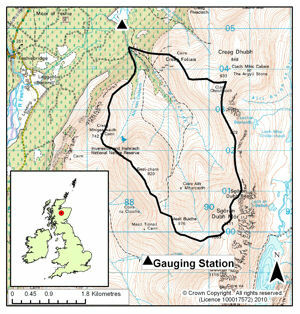 The catchment comprises part of the Cairngorm National Nature Reserve and land-use is confined to deer grazing. The stream gradient is steep and exposed bedrock, rapids and waterfalls and large boulders characterise the monitored channel section. 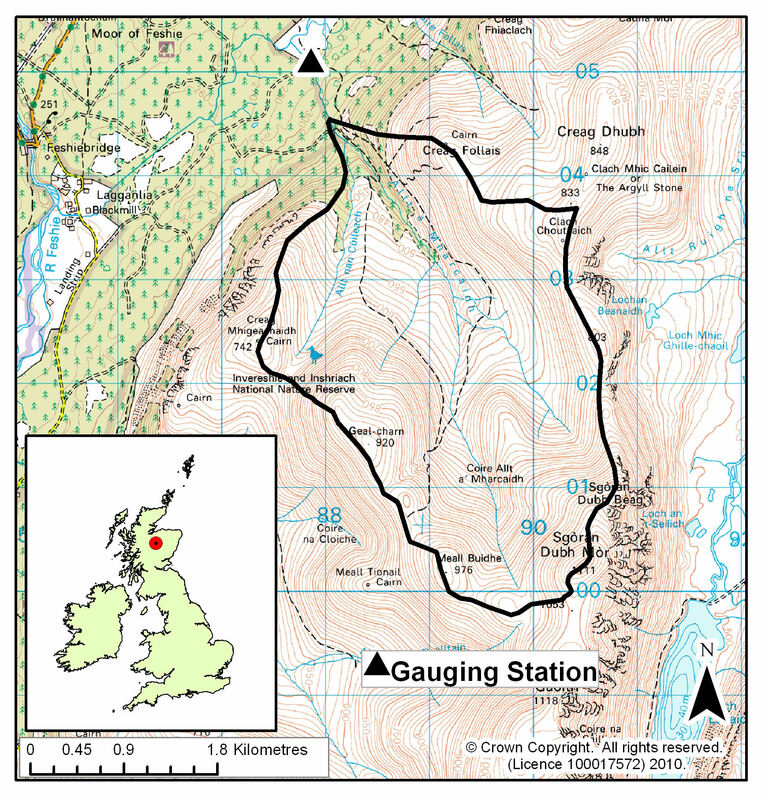 There is also a terrestrial ECN site located in the Cairngorms National Nature Reserve. Allt a'Mharcaidh is classified as having moderate acid deposition. The Upland Waters Monitoring Network website has information about this site and data summaries from the UWMN annual report. This site is part of the Acid Deposition (UKEAP) network.